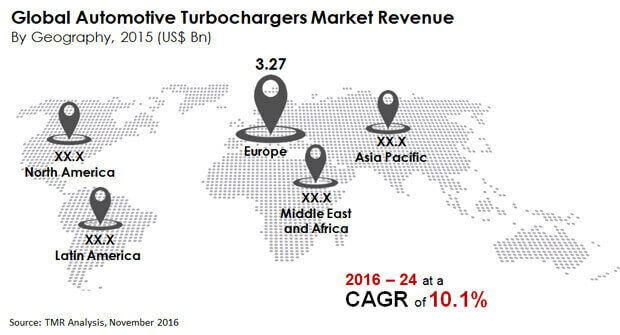 In a highly consolidated global market for automotive turbochargers, five main players accounted for about 66% of the share in market in 2015. The five main players are Honeywell International Inc., BorgWarner Inc., Cummins, Inc., Mitsubishi Heavy Industries Ltd., and IHI Corporation. They are slated to hold on to their dominant positions in the years ahead as well. However, due to different challenges facing the market and maturating markets in advanced countries, the well-entrenched players may trim some of their market shares, paving the way for new entrants. Companies, namely Bosch Mahle Turbo Systems, Continental AG, Eaton Corporation PLC, and Turbo Energy Pvt. Ltd. are forecasted to gain market share steadily in the years to come. A report by Transparency Market research, predicts the overall revenue in the global automotive turbochargers market to clock a healthy CAGR of 10.1% from 2016 to 2024. Expanding at the aforementioned pace, the revenue is expected to become US$20.35 bn by 2024-end from US$8.56 bn in 2015. The main three technologies leveraged to manufacture automotive turbochargers are twin turbo, wastegates, and variable geometric technology. Each technology has certain advantages and a few disadvantages as well. Among the three, the variable technology turbochargers dominate the market with maximum share in it. They are embedded with flexible minute vanes. They channelize the air flow of the exhaust along a turbine at various angles. Variable geometry turbocharger technology is predicted to rise at a CAGR of 9.4% between 2016 and 2024. Geography-wise, the key segments of the global market for automotive turbochargers are North America, Latin America, Europe, Asia Pacific, and the Middle East and Africa. At present, Europe leads the market because of the advanced economies following strict rules pertaining to emissions. In 2015, Europe accounted for 38.2% share in the market. However, due to several difficulties involved in the installation of turbochargers in this region, the demand will likely take a beating in the years to come. The market for turbochargers has also become saturated in Europe and is witnessing a shift towards electric and hybrid vehicles. Asia Pacific, is another dominant market when it comes to creating demand and is predicted to retain its position in the years to come as well with manufacturers opting for turbochargers to facilitate higher fuel efficiency and lessen emissions. One factor countering the global market for automotive turbochargers is the rapid unveiling of more evolved versions of electric cars that helps to reduce emissions drastically. Increasing cost of non-renewable fuel which is egging consumers to switch to electric vehicles will likely hamper demand too.